Rib White & Blue | Akron, Ohio | dreaming of the next bite. For the love of food and all things BBQ and ribs, we headed down to Rib White & Blue, Akron’s annual 4-day fourth of July Rib Festival. 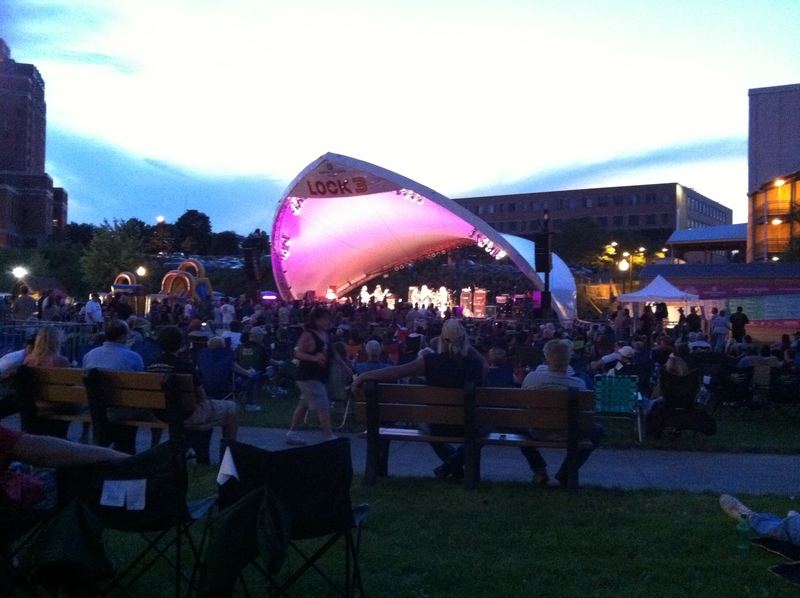 Boasting ten vendors from around the country this year, the rib festival shuts down Main Street around Lock 3, making for an enjoyable evening of BBQ favorites and live music. I was a bit surprised by the number of vendors. Only ten? Shouldn’t this be a local thing with hundreds of participants? 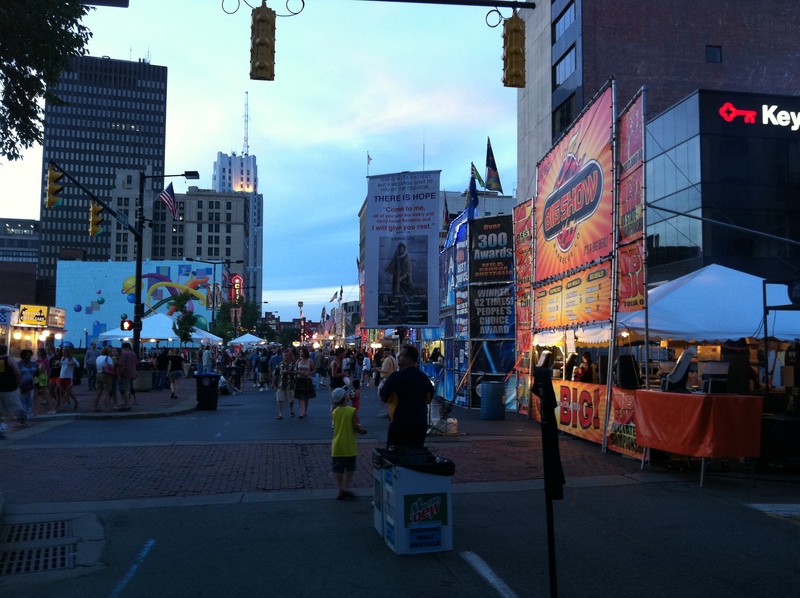 I was envisioning an event more like Taste of Canton, with lots of local stands set up, charging a few dollars for a rib or two. That way you can hop from stand to stand and try them all! Instead, we have the rib “kings” from across the country, with their full-size traveling displays and practically commercial kitchen set-ups. Not exactly what I expected. Disappointment aside, we were now faced with the tough decision. Recognizing only one of the vendors (Old Carolina in Massillon – which is delicious, but we can have this anytime) we decided to go with the longest line, thinking they must have the best. 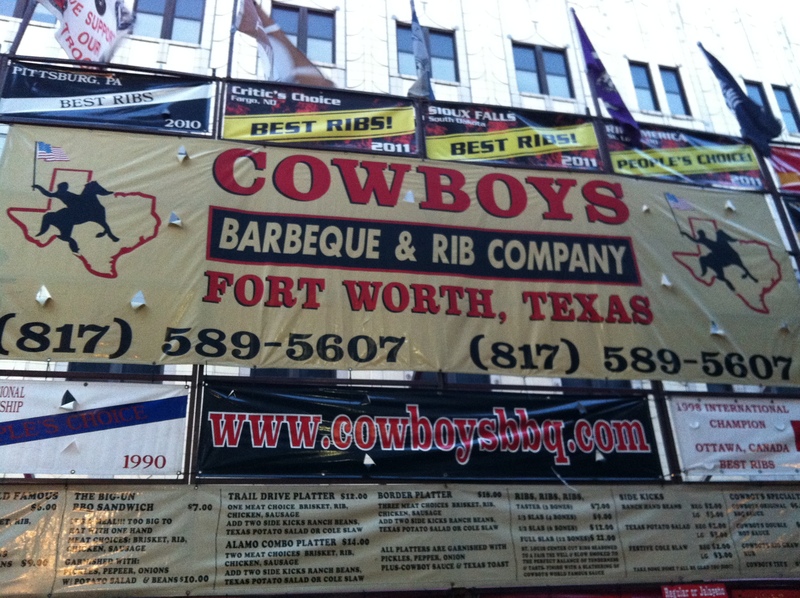 The winner was Comboys BBQ and Rib Company out of Fort Worth, Texas. Instead of getting the rib “sampler” – i.e. 3 ribs for $7 (?!!) we opted for the Alamo platter, which gives you sampler of two meats, and also choice of two sides. So for $14, we ended up with 3 ribs, a generous helping of brisket, cole slaw, and “side kicks ranch” baked beans. The ribs were good, with a nice smokey flavor and tasty sauce. But the star was definitely the brisket. It was moist, tender, juicy…..slow-cooked to perfection really. And the portion was excellent compared to the ribs, probably triple the amount of actual meat. Also the cole slaw was quite delicious – tart but creamy, not very sweet but very tasty. The beans were smokey and almost spicy which neither of us cared for too much. I personally like my BBQ beans to have a little sweetness. So we enjoyed our BBQ goodness on the grass while watching a band play. (Believe it or not we were both full after the first course.) Very nice, relaxing time in downtown Akron. I love seeing downtown looking so great and doing so well! I do wish they would reconsider their rib festival though, and encourage more local participation. Why not do a contest and with small (inexpensive) samples – I think that type of a format would attract more people and feel like a more “authentic” Akron event. (Just my two cents.) Either way, I’ll still be back next year. 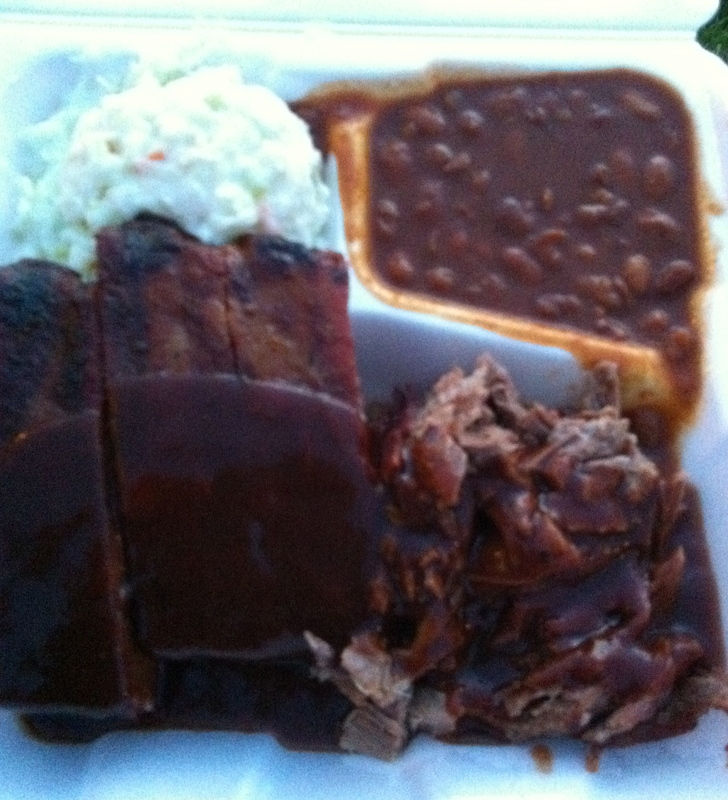 This entry was posted in Akron, OH and tagged BBQ by Yvette (@foodiedreamer). Bookmark the permalink.